“During the 70 years, the relevance of the UN Charter was highlighted by geopolitical changes in international relations. However, the conditions imposed by the dynamics of decolonization, by the Cold War implications and by economic globalization proved the value of this founding document, as it has helped promote human rights, democracy and the rule of law. The Joint Statement of the US President and the Prime Minister of Great Britain, signed on 14 August 1941, and known as the “Atlantic Charter”, had already established a set of basic principles that would be reflected in the forthcoming UN Charter, including collective security, the mechanisms of peaceful settlement of disputes and the economic and social cooperation framework. Even then, these principles manifested their force of attraction for countries on all continents, as countries rallied to the Allies’ common cause, and served to isolate the aggressor states and fascist ideology.On 1 January 1942 the United Nations Declaration, signed in Washington by the 26 belligerent powers, was an official statement of support for the future UN Charter. Subsequently, 21 other states signed the Declaration, forming the configuration of the founding members of the world organization. His bachelor's degree in civil engineering, from Addis Ababa University, was fundamental for building a solid scientific education, giving him access to a high level knowledge and expertise. The master degree, with Tampere University of Technology in Finland, gave him an European and international perspective upon the transfer of knowledge, expertise and technology. We will not analyze here the political activity of H.E. Hailemariam Desalegn, but taking actively part in the political life of his country, it gave him the opportunity to work with people of Ethiopia, to be in the middle of Ethiopia’s people, to efficiently communicate, and being able to implement at the high level management of the country activities, reflecting the reality of Ethiopia and the wishes of Ethiopian people. Hon. Senator Ionel Agrigoroaei presents ROMANIAN PARLIAMENT MEDAL for H.E. Prime Minister Hailemariam Desalegn. 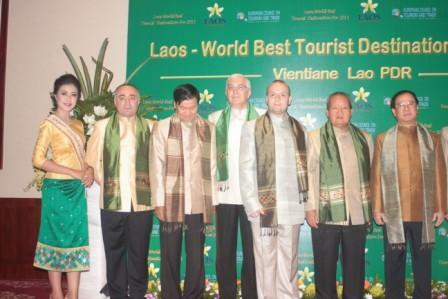 On the occasion of European Council on Tourism and Trade General Meeting for 2015 the participants will have the opportunity to watch the best travel documentary of 2014, a production of Laos National Television, presenting the World Best Tourist Destination Award ceremonies, held in May 2013 in Vientiane. The announcement was made by Mr. Nicoale Nicolae, media director of European Council on Tourism and Trade in the presentation of the high awaited event that will take place at the end of the month. The documentary was broadcasted only in 2014 in 2015 by 28 televisions and watched by more than 20 million viewers.From 25 june 2015 the documentary will be available (in selections) for the general public to see at European Council on Tourism and Trade channel here. The art show is presenting the most striking features of Laos-World Best Tourist Destination declared by European Council on Tourism and Trade showcasing the rich history and cultural patrimony of the country, the fashion of past and present Laos people and minorities and different regions of the country, finally culminating with a parade of artists presenting national Lao music and international acclaimed artists.